First, I just to publicly thank one of my lifelong friends Frank S., owner and operator of the Emily Rose here in Brooklyn for making a very generous donation to the NY RFHFA. Frank who is the older brother of 'deck boss' Matty of the HH out of Cape Cod, MA., has been extremely supportive of the continued efforts of the NY RFHFA over the past year. Thank you Frank! I apologize for sending this to all the readers but I know that many of you knew and were fond of "Willie" Young. Sadly, he has passed away on October 30th and should you be interested in paying your respects, the arrangements are noted below. Please note that we were only informed a few minutes ago, or this would have been sent out sooner. I spent a few days with Willie at a MREP workshop a few years back, and in fact we sat together and finally had some reasonable dialogue between both of us there and at the dining table especially when talking about one particular fish! Willie was having some health issues at that time, but boy, the fight was still in him up until we heard the news this morning. We last saw him attend the bluefish scooping meeting a few months ago (he sat next to Pat A. ), and he did not look well. May Willie be in the comforting hands of God at this time. "The Recreational Advisory Panel (RAP) meeting started at 10:00 AM. The meeting was a preliminary meeting to look at the catch statistics from this year's compiled data, comparisons to last years fishing season, draw up a priorities list to give to the New England Fishery Management Council, listen to a brief discussion on the potential of new tools to reduce recreational discards, listen to a presentation of recreational workshops planned in the future (along with our input on such) and, the most important, review data that shows that the recreational quota should be re-allocated up as compared to the commercial quota. Re-allocation was the number one priority that was moved on to the Council today. We also talked about a limited entry plan in the party/charter fleet, specifically a control date limiting permits to those who had them before that particular date. We didn't get into details. We just moved the discussion forward. Those representatives of the private sector at the meeting were concerned about not being able to get a party/charter permit if this idea was acted upon. But the discussion went no further than this. There was talk around the cod data. The haddock, and its relationship to catching cod, looked better. 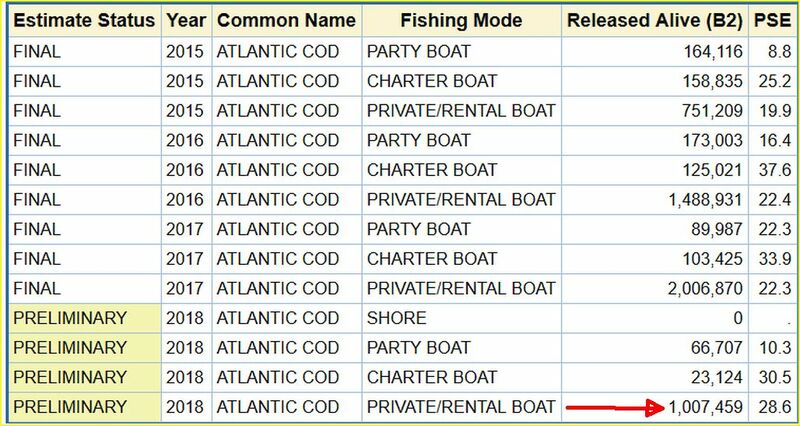 In fact, the data seemed to show that the party/charter fleet has been able to stay away from cod while fishing for haddock. Of course, we knew this all along. This not so much with the private boats. But this is the first time the data has leaned this way, in our favor. Also, I think there is a good chance that we will be able to keep haddock throughout our season next year. This may or may not happen. But the thrust of my being there was to give us, the recreational angler, more opportunities to keep haddock while also being conservative, or conservationist, in the process. So, in short, the meeting was held to get us ready for regulatory decisions that we will be asking for in the January meeting. We shall see. As usual, I am optimistic." It is nice to read that Captain Tim is optimistic, and maybe so after looking at the latest M-RIP-off data query table on haddock. Notice that there is a pretty significant drop in PRIVATE VESSEL mode harvest. Hmmmm, and I wondered if we will see that with other species, not only in the NE mgmt. region, but for us here in the Mid-Atlantic region especially when it comes to private vessel effort estimates on biscuits - Black Sea Bass. Here I hedge on any thoughts on expanding haddock harvest for 2019 (starting May 1, 2019), due to the implications with the continued reported estimates on discards and the resulting mortality with codfish. Many fishermen as well as regulators realize the relationship of high possession limits for haddock, and fishermen spending more time at the rail in harvesting towards the 'ORL' or 'OLR' for haddock, which results in a documented increase in cod mortality especially in the GOMaine area. Needless to say with 900 comments at 1200hrs today, it is obvious that we have jumped the proverbial regulatory shark of ridiculous comments coming from the fishing public. From the "opening of pandora's box," to "a fragile species," "opening commercial harvest," "destroying the stock" and so on, I am still waiting for just ONE individual (fishermen) to present actual data on how this will somehow increase fishing effort and harvest in the acknowledged and well noted area (box with red arrows) where most effort would be concentrated. Guys, just read the information on the SB - BITZ before you copy someone else's ridiculous comments (go here: https://www.federalregister.gov/documen ... ansit-zone ). It is extremely hard to "fathom" if there will be ANY CHANGES in angler behavior whether this area is opened to RECREATIONAL SB harvest, or remains closed... and a number of YOU out there do know what I am hinting about. Law Enforcement/For-Hire Workshop (MAFMC)... this has been a brewing issue here and we have ALL TOO MANY ON THE REGULATORY SIDE who have little idea on constitutional law as far as forcing for-hire operators to conduct the warrant-less search by operators WHO ARE NOT sworn law enforcement, on searching the private property which fishermen bring on party and charter boats. The following week is the Fluke, Scup and Biscuit MAFMC A.P.- Monday, November 19, 2018 from 1:00 pm to 4:00 p.m. What wonders of the continued "dog and pony" show when it comes to BSB mis-management for the 2019 calendar year as there has been the continued push for "regulatory stability" (whatever that means) and the RHL with cuts to the states of NJ, NY, CT, RI and MA may have to again deal with in 2019. Due to the extremely unstable weather during the past two months (Wave 5 Sept - Oct), BSB landings should be extremely down for all recreational modes, with maybe the lowest amount in days fished by everyone this fall. We will see when the preliminary estimates are released sometime in mid December. Also and a reminded to Mr. Regulatory Wizard.... if regulators thought we were upset last year with BSB regulations in NY for 2018....... just saying that this MUST STOP with the continued whittling away of the most robust fishery managed by the MAFMC. Oh, let us not forget the initial news from the ASMFC on the striped bass benchmark which we were personally told at the meeting should come out around the end of this month. From what we were told, a number of models were used this time to measure the various biological indices, and of course a number of fishermen are now thinking that this may somehow be found to justify the narrative of the continued decline of SB SSB and total biomass. We hope not, and hopefully the data and conclusions we draw from this benchmark are as accurate as possible for both the stock and the fishermen who target striped bass. Another note, and this is from what I keep hearing about NYS FFL holders who are not reporting commercial tautog landings. It was again mentioned to me this morning, and I just like to point out that those who are not reporting "most likely will be hurting themselves in the coming years" when this morphs into some type of IFQ fishery. This coming Tuesday, GET OUT AND VOTE! Congress with Lee Zeldin who has been a leader in Washington, DC for supporting fishing families as well as fishermen, and also Peter King. NYS Senate, with Senator Phil Boyle (4th District) and to DEAN MURRAY moving over from the NYS Assembly to the NYS Senate. Yes it is tough here living in the deep blue one Empire State, but for all Americans just keep in mind when in the election booth on which political party supports personal liberties and freedom in our great nation! Best wishes for a speedy recovery for two noted fishermen from Sheepshead Bay, one whom when I last spoke to him the other day was supposed to undergo a triple-bypass at the VA yesterday. The other to a fishermen who was involved in unforeseen accident while hunting, and as I was told had to have a medi-vac to a hospital, and now is dealing with an extremely painful and long recovery. Ps, within the coming days I will start updating and posting new stories on FISHING UNITED .com - Thanks to all who continue to send in pictures and fishing stories. On this windy early Saturday afternoon, I went over a link sent to me by someone involved "in the process" on an article written by Captain John McMurray for Fisssues .org. I like to again repeat that the NY RFHFA was at the last Commission meeting and Captain Joe King Cod and Captain Anthony Testa as well as myself spent at least 25 minutes talking to John over the striped bass issue, and It was good to see that he did understand not only our position on the SB - BITZ but the bigger issue "if an action was taken to open up the coastal EEZ to striped bass fishing/harvest." "The folks who I spoke with who back the Block Island Transit Zone opening say they DON’T want that. I hope they will make that abundantly clear not only during the public comment process but to the east end politician who carries their water when such consideration comes to bare." We want to both clarify and stop this fraudulent narrative that we continue to hear and read about "they want to kill more fish." 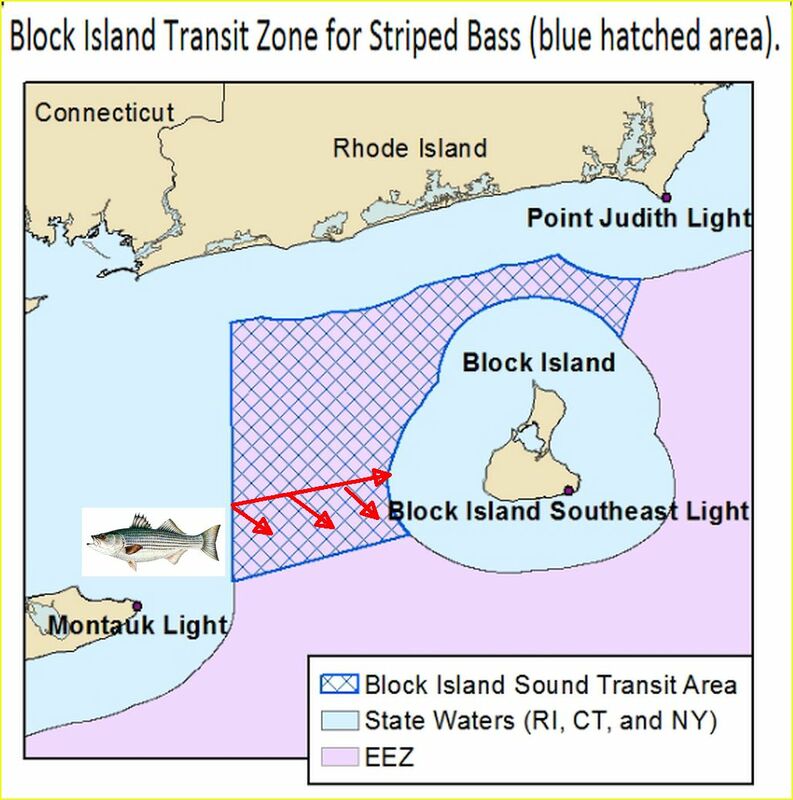 How many times can we repeat that we want the most responsible use of a valuable marine resource where all fishermen can have "reasonable" access to the striped bass fishery during the calendar year? Folks, we will continue to point out to "read all available online documents* pertaining to striped bass, with those written in previous years and the most recent in order to get a better understand on how we have arrived at this point." Lets stop with the "slippery slope" straw man argument that has distorted the intent for the SB -BITZ. Ps, just keep in mind when comparing year to year harvest between the states, consider how unstable the weather has been since the winter of 2015. The more recent weather over the past years has now caused much harsher winters, unseasonably colder and wetter springs, windier summers and fall - thus an increase in unfishable weathered-out days during the season. We continue to see much larger swings in our regional weather patterns, and no doubt this has a greater impact on the MRIP powerball harvest and catch estimates for ALL fisheries. For the striped bass fishery, depending on the state and the weather, the 'variability' in the data can either increase or decrease if that state and its fishermen have much greater access to rivers, bays, harbors and sound areas to fish upon. This is in contrast to another coastal migratory species which lately is displaying something much different "in where and when they are now found," as we look back to just a few years previously. That of course is with all the talk about bluefish. If you are looking for more stable harvest estimates, there is less statistical error in the for-hire party and charterboat modes. Below is the information which Captain John McMurray mentions in his piece on "Landings were way down during 2017." When you drill into the "why" much of this can linked to the unstable weather we have had and are currently experiencing. I have to thank Captain John for accurately mentioning the NY RFHFA position on any full EEZ striped bass opening.